Manchester United boss Sir Alex Ferguson pointed an accusing finger at referee Martin Atkinson after the FA Cup quarter-final defeat by Portsmouth. Ferguson felt United had a penalty turned down when Sylvain Distin blocked Cristiano Ronaldo, before Sulley Muntari's late winner from the spot. Ferguson told MUTV: "It's absolutely ridiculous. I cannot explain it. "Managers get sacked because of things like that and he's going to referee a game next week." United had substitute keeper Tomasz Kuszczak, on at half-time for injured Edwin van Der Sar, sent off for a foul on Milan Baros that led to Muntari's 78th-minute spot-kick. Ronaldo also revealed a lack of protection from officials had made him "scared" to play his natural game. "Sometimes I say that this is the best league in the world, but sometimes they don't protect the skilful players," said the Portuguese winger. "After what happened to the Arsenal player Eduardo da Silva, I am scared to do my skills. "The referee against Portsmouth was unbelievable. In the first five minutes, there were three fouls and he took no action and then he failed to give a penalty. It's difficult to play like this. "Sometimes they just protect the defenders and I am thinking about having to change my game because it is difficult to play like that. "Diarra did not even try to play the ball when he tackled me and he wasn't even booked. It's a joke. So often, there were fouls and the referee did nothing." Ferguson also directed his wrath at Keith Hackectt, thegeneral manager of the Professional Game Match Officials Board. "Hackett has got a lot to answer for in this country," said the Scot. "He's not doing his job properly. "He should be assessed like everyone else is assessed. I'm assessed as a manager, the players are assessed, referees are assessed. "Martin Atkinson will referee next week, no problem, but his performance today should not be accepted in our game. "I agree with Sepp Blatter, the standards in our game as opposed to the Continent - the tolerance level - is behind Europe. I think it's a big problem." 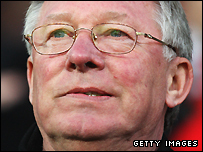 After seeing his side's hopes of repeating their 1999 Treble extinguished, Ferguson said: "The game was decided by the decision not to give us a penalty. "They had great confidence to hang on knowing the referee was on their side. "Lassana Diarra had eight or nine fouls in the match. It's incredible. I've got to agree with Arsene Wenger. Someone is going to get a serious injury in our game. He's had one himself with Eduardo. "It's not a nice thing to talk about, but the treatment Ronaldo is getting I'm worried about him. "Keith Hackett is in a nice, comfortable position and does nothing really. I don't think he makes a contribution to the referees' performances in our country. "That should be addressed. He's not doing his job properly. "That guy (Atkinson) will go and referee next week no problem. You see his favourites always get the games and that's disappointing." Portsmouth boss Harry Redknapp contemplated a Wembley appearance in the semi-final, saying: "It's fantastic. To come here was the worst draw of the lot. It was a great performance. "We came here the other week and got slaughtered but we've come back and turned it around. We worked, we had a plan and we stuck with it. "You always have to ride your luck, they are a fantastic team. They are different class. We deserved our luck. "It's a great day, great for the fans, I am delighted for them."